Comments: King Rails are found in the eastern and southern portions of the Great Plains. They usually occur in freshwater marshes with a mosaic of marsh vegetation and open water. They feed on crustaceans, aquatic invertebrates, grasshoppers, small fish and aquatic plant seeds. Like other rails, they migrate at night. King Rails are larger and browner overall than Virginia Rails and always have brown cheek feathers. 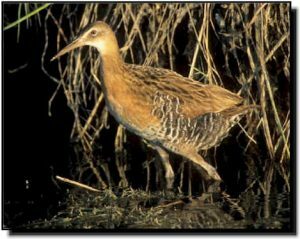 Clapper Rails are also similar, but are smaller, have gray cheek feathers and lack the chestnut-colored upper wing coverts found on King Rails. Apparent long-term population declines have led to the development of a comprehensive conservation plan for the King Rail and listing as an endangered or threatened species in several states and Canada.